Home sits back 1/4 mile from road for privacy...Back to the Land, Homesteading Security in the Country - Remodeled Log Home, 9 Inch Full Round Swedish Cope Logs, 2 acres (with adjoining 8+/- acres for sale at $4,000 per acres). This home has a "no-worries Termite Shield" installed. Partially fenced and a 12x16 Out-Building. The first thing everyone says when they come to this home is, "What a beautiful place this is . . ." You'll see why the current owners bought this property in Taft TN. Tennessee has low county taxes and no state income tax. This property has privacy and beautiful country views, rich farmlands and abundant wildlife. It also has natural blackberry, huckleberry and grape arbors. The 30'x100' Garden Area has its own water spigot. 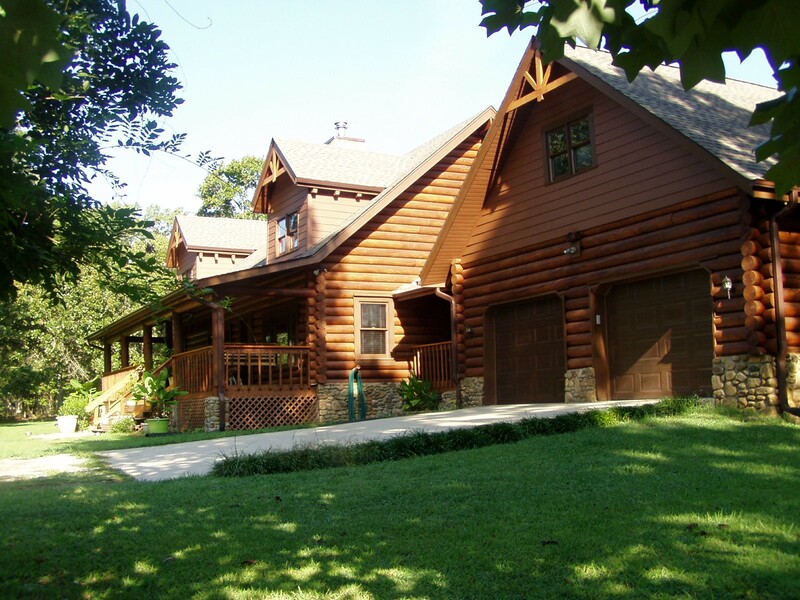 This 3 Bedroom, 2-Bath Log Home was built in 1987. The Main Level is 1,500 square feet. New 5" Hickory Hardwood Floors are in the Entrance Foyer, Living Room, Hall, Kitchen, Breakfast Room, Formal Dining Room and Wash Room. The awesome Kitchen has hickory cabinets and comes with newer stainless appliances. The adjoining Breakfast Area, Bar Area and Dining Room make entertaining easy. The open floorplan in the Living Room includes a freestanding wood-burning fireplace. Also on this level are 2 Bedrooms, a full Bath and a convenient Laundry Room. The 8' x 47' covered Front Porch, with swing, is great for entertaining or just relaxing!!! This home's upper level Master Suite has a cozy see-thru fireplace between the Bedroom and the Sitting Room. The private Master Balcony is a great place for reading, relaxing or getting some sun!!! The adjoining, private Master Bath includes an over sized heated Jacuzzi (with fill-to-the-rim overflow), a large tiled shower and his & hers granite-top vanity. The built-in seat and towel cabinet are useful added features. The his & hers walk-in closet tops off this Private Suite!!! The upper stair-landing has room for an Office Nook or bookcases. The large Loft could be used for a Game Room or Day Room. There is also a large seasonal storage closet on the Upper Level. The covered Breezeway Deck adjoins the home and over-size 2-car Garage with a Finished Bonus Room above the garage. The home has a Covered Back Porch and an uncovered area for your BBQ grill. The 2 acres has a huge level open back yard, perfect for sports activities. Mature trees surround the perimeter for shade & privacy!!! All Electric approximately $115/Monthly Avg. This home is convenient to Madison, Huntsville, Fayetteville and Ardmore. Shown by appointment only. Will need to provide pre-approval letter before showing. LISTING AGENT HUSBAND OF SELLER. Ispring 7-Stage Reverse Osmosis Water System With Booster Pump, Alkaline & UV Light For Purified Drinking. NEW Whirlpool Energy SMART 50-Gallon Electric Water Heater W/SMART Grid Technology. NEW Fascia With Metal Water Guard Flashing Around Edges And Rake Molding. Ice & Water Guard Roofing Underlayment Installed - Porch Roof, Valleys, Ridge, And Around Chimneys. NEW Pump Tank & Pump Switch. According to Matt Dobson with the National Association of Home Builders (NAHB), log homes do offer greater protection from the elements and natural disasters. Dobson says these structures are typically over-engineered and better capable of withstanding natural disasters. He believes that with proper maintenance and treatment, log homes last longer than conventional homes. THE National Bureau of Standards and Technology erected test structures and recorded their energy consumption, their findings were amazing. They found that over a 3 week spring heating period, a log structure used 46% less energy than the same sized insulated wood-frame structure; during the 11 week summer period, the log structure used 24% less cooling energy than the insulated wood frame structure; and during the 14 week winter period; the log structure used 15% less than the insulated wood-frame structure. There is often confusion about the energy efficiency of log homes as compared to traditional stick-built homes. There are two primary factors that determine the ability of a wall to be an effective barrier to temperature differences. One is "R-Value," which is a numerical measure of a material's resistance to heat flow over a defined thickness of that material. Second is "thermal mass," which is a measure of a material's ability to store heat and thereby delay heat flow. Traditional Insulated Frame Walls Conventional framed walls typically use fiberglass insulation and have an R-value of about R-13 to R-19. Fiberglass is a good, lightweight insulating material which traps air within its fibers and is therefore a poor conductor of heat. It, however, has very low mass and does not store heat. Log walls are dense and heavyweight, making them poorer insulators of heat than air-filled fiberglass walls. In fact, a log wall the same thickness as an insulated wall (about 6-7 inches) would only have an R-value of about R-9. However, the high density of solid wood also creates an important "mass effect." Instead of heat being conducted through a log wall, as the lower R-value might suggest, the heat is actually stored in the logs and significantly delayed in its release. This allows, for example, high outside temperatures to be effectively blocked and stored during the hottest part of the day, and released during the cooler night. In winter, heat from the inside of your home is stored in the logs and released back during the colder night. In effect, thermal mass tends to even out large temperature changes. This interesting phenomenon is often referred to as "thermal capacitance." Because of thermal mass benefits, log homes, can be 2.5% - 15% more energy efficient than comparable stick-built homes, according to the National Association of Home Builders, Log Homes Council. Assuming other parts of the home, such as roof, floors, windows, and doors, are similarly insulated, log homes can cost significantly less to heat and cool. Many log homes in cold climates are heated with nothing other than a single fireplace or stove. Note: No home, no matter the type of construction is energy efficient if poor construction methods are used. This style is known for its beauty, strength, and efficiency. The saddle notched corner system is aesthetically pleasing, and locks the two walls in a corner together. Log sizes are milled in a range from 6 to 16 inches in diameter. Offered by Ernest Smith with Abode Real Estate Equal housing opportunity.